Knitting is not just for babies and grannies. There is growing evidence that knitting is on the up and is now really cool. No longer considered something for grannies using baby knitting patterns, or the ‘blue rinse brigade’ as my husband so delicately puts it, but people such Julia Roberts and Tracey Ullman are among its avid fans. British comedienne Tracey Ullman has even co-authored a knitting guide called ‘Knit 2 Together’. And apparently Sarah Jessica Parker likes to knit between takes on the movie set. Not only are women being drawn to this ancient art form but men are knitting too. The men’s knitting site menknit.net offers a forum for male knitters and has the humorous motto: “Man Enough To Knit; Strong Enough To Purl.” While many tend to think of knitting as being a womanly craft there is some thought that it was actually men who started knitting when they knitted their fishing nets in years gone by. But really, because of the delicate fabric of knitting cloth its true origins and age of the craft are not known. A survey by the Craft Yarn Council of America found that knitters under age 35 were on the increase and that since 2002 there has been a 150 per cent rise in knitters aged 25-34 – that is some 6.5 million consumers. Under 18 years of age the figures are still astounding at 5.7 million in America alone. 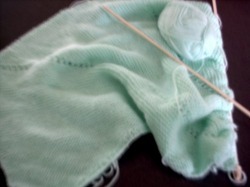 It is human nature to want to create and what better way than in the relaxing pastime of knitting. So dig out those old patterns, yours, your mother’s or your granny’s, dust them off and look at them with new eyes.